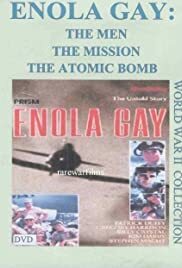 The decision to drop the atom bomb, the secrecy surrounding the mission, and the men who flew it. Captain Bob Lewis: I was on official business. Captain Bob Lewis: Do you expect me to control the weather? Captain Bob Lewis: My compass was out, SIR. Captain Bob Lewis: It was on the approach to the airport. Colonel Paul Tibbets: So why didn't you use the airport? Captain Bob Lewis: Because I was out of gas! It was one gorgeous piece of flying. I have read many books and have seen many films about the Manhattan Project and dropping the atomic bombs on Japan. This film gets the chronological timing wrong in several places and uses comic relief when none is required. Bob Lewis is portrayed as an old buddy of Paul Tibbets, yet I do not recall ever reading or seeing any documentation that would support such a relationship. Tibbets was portrayed as saying he wanted to pick his own men rather than the ones selected by his superiors. In fact, Tibbets did indicate that he wanted to make personnel selections, but that was probably no more than thirty men he had commanded previously. A few of the men I remember he selected included his radio operator, bombardier, navigator, and two other enlisted men who actually flew with him on the mission. The 509th Composite Group consisted of about two thousand men, so his personally choosing less than fifty of the two thousand was no big deal. It seemed the director, the writers, and the actors had little or no knowledge about the Manhattan Project and especially the 509th mission details. It seems a shame this film falls so short in these details.